originally from Texas and now residing in Knoxville, Tennessee, Connie Gaertner has lived in eight different states stretching from coast to coast. She is an award winning artist who continues to be juried into local as well as National Shows. 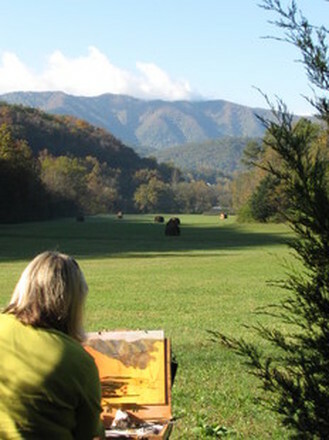 Her love for the outdoors is reflected in her paintings with plein air painting as her passion, but she is just as comfortable in her downtown Knoxville studio. Connie studied at Sam Houston State University. Through her continuing education she has studied with award winning artist at local, regional, and national workshops. She credits them for the encouragement, support and criticism which have helped develop the artist which she has become today. She retains membership with Oil Painters of America(OPA), The American Impressionist Society(AIS), American Women Artist(AWA), Blue Ridge Mountain Arts, and Knoxville Arts & Cultural Alliance. Her paintings maybe purchased by contacting Connie directly, juried shows, and private showings. Thank you for taking time to view her work. She hopes it will give you as much pleasure as it did when she created it. Copyright © 2019 Connie Gaertner, Knoxville,TN, All rights reserved.